Small, independent farms are a valuable part of our Gulf Coast heritage. Allen Eubanks of Lucedale, Mississippi, is the fourth generation in his family to work the soil. We buy his fresh cantaloupes, watermelons, bell peppers, tomatoes, cucumbers, squash, sweet corn and, recently, sweet potatoes, plus a large portion of Mississippi blueberries. The Sirmon family has spent over a century farming the same Baldwin County, Alabama, landscape. For the past 30 years, Joel Sirmon and his father, Gordon, and brother, James, have been growing sweet potatoes. They are sold at Rouses Markets all over the Gulf Coast. The tubers are raised from sprouts, or “slips,” the green shoots from mature sweet potatoes, that were selected and stored at the end of the previous planting. Sirmon’s sweet potatoes are exceptionally sweet and perfect for traditional sweet potato casseroles. Sirmon Farms also provides us with hydroponic lettuce. Michael, Matt and Wayne Garber carry on an Iota, Louisiana, farming tradition started in 1881. Michael manages the farm crop production. Matthew deals with the storage, packaging and marketing of sweet potatoes and other crops. And Wayne handles the day-to-day administrative management of the business. Their 5,000-acre farm sits on a sandy ridge between Bayou Nezpique and Bayou Des Cannes in the heart of South Louisiana’s Cajun Country. The gentle, moist breezes from the Gulf of Mexico, along with their rich sandy loam soil, provide an ideal natural environment for their sweet, golden Louisiana yams (sweet potatoes). Father and son farming team Ben Becnel Sr. and Ben Becnel Jr. are the fifth and sixth generation to work their family-owned farm. The two have been in business together for over 40 years, since the younger graduated from high school. The secret to their success, they say, is in their soil. The Becnels manage 250 acres in the rich delta soil along the banks of the Mississippi River in Plaquemines Parish, Louisiana. Their land—250 acres of fields and trees—lies roughly fifteen miles downriver from the tunnel, around Jesuit Bend. This gives their satsumas, oranges, grapefruits and Meyer lemons a uniquely rich and sweet flavor. Ben & Ben Becnel also provides us with Creole tomatoes during that season. Fruit trees grow everywhere in Paulina, Louisiana, in St. James Parish, on the north bank of the Mississippi River. 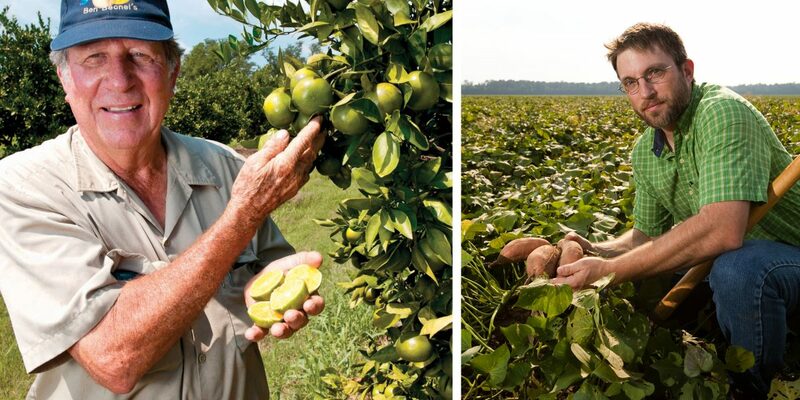 Robert “Butch” Millet has been farming citrus in Paulina’s delta soil for over 40 years. His citrus orchards produce satsumas, oranges, lemons, limes and grapefruit. We’re Proud To Support Our Local Fishermen. We sell more local shrimp, crab, oysters, fish and crawfish than anyone on the Gulf Coast. Tommy’s Seafood in Chalmette, Louisiana, helps make that possible. The family owned company supplies us with wild-caught head-on and head-off shrimp, live and cleaned frozen blue crab, shucked oysters, and fish fillets. The Delaunes also shuck and package our Rouses Markets brand of Louisiana oysters.